Near record heat this week? Not really. 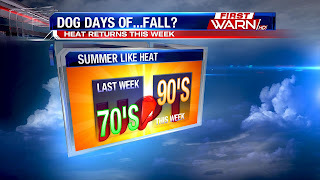 Record high temperatures for the first week of September are in the low 100's, and forecast high temperatures will be close to 90 degrees - a good 10 degrees (or more) away from the records. But, it will feel a lot different compared to the 60's and 70's we were at last week. So, anyone who will be spending a prolonged period of time outside this week should prepare for heat index readings nearing the middle, to possibly, upper 90's. Once we get past the Labor Day weekend holiday temperatures will be more seasonable, and could even fall below average. September 1st is the beginning of Meteorological Fall, but it will actually feel like the beginning of July. A pattern more typically seen in the dog days of summer will make an appearance this week and bring above normal temperatures. A large ridge of high pressure will build across the Plains and into the Midwest. High temperatures this week will trend nearly 10 degrees above the average high, which should be in the low 80's. Highs will reach the upper 80's to lower 90's. We won't get a break from the heat and humidity until Sunday when the next cold front is forecast to move through. We also won't get much rain this week. Weak upper level disturbances moving through will provide only small, daily rain chances for some. The better concentration for rain will be to the southeast of us, but with the heating of the day we could see isolated afternoon/evening storms. However, the rain threat is very minimal with chances only between 10-20%. The fog Sunday morning didn't last long, but skies remained cloudy through most of the afternoon. It was only until mid to late afternoon that the cloud cover began to break, and temperatures warmed into the middle 70's. But, did you notice when the cloud cover started to clear, the sky above looked hazy? Part of that has to do with the wildfires out west. 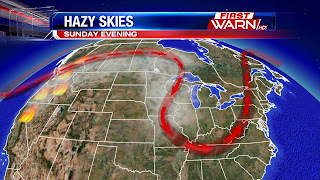 The smoke became caught in the jet stream that is now moving through Midwest. And while health related issues are not anticipated, the haze/fog/smoke could be lasting a little while through Monday because of what else is going on within the atmosphere. This image to the left is the latest forecast sounding from the Quad Cities National Weather Service. What it shows is the temperature and dew point profile from the surface, all the way up to the top of the atmosphere (or until the weather balloon breaks). What sticks out to any meteorologist when first looking at this sounding is the temperature inversion around 900mb (a little over 3,000ft above). What this shows is a warmer layer present at that height. An inversion acts like a lid. It's hard for things to get past the inversion. This was part of the reason why the clouds were slow to clear Sunday. And once they did, any moisture still present in the atmosphere became 'trapped'. And with the inversion, or lid, on the atmosphere low level moisture will remain in place once again Sunday night. This will lead to locally dense fog once across parts of Northern Illinois and Southern Wisconsin. The Quad Cities National Weather Service has already issued a Dense Fog Advisory for Whiteside County beginning very early Monday morning. Hurricane Katrina made landfall ten years ago today. Nobody knew at the time, but she turned out to be the costliest natural disaster in the history of the United States. She caused over $1 billion in damage across the southeastern U.S. Not only that...she was also ranked in the top five for fatalities as 1,836 people lost their lives as she marched through Louisiana, Mississippi, and Tennessee before becoming weak enough to not be considered a tropical system. Katrina was fascinating for a couple of reasons. First, she developed initially in the middle of the Bahamas as a weak tropical storm with winds of 40mph. 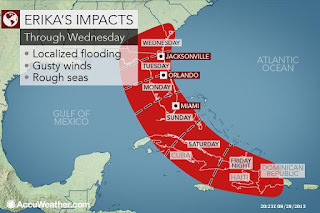 She then moved northwest like most systems do in that area, but do to other meteorological factors, she took a dive southwest and made landfall in South Florida near Miami and Ft. Lauderdale as a category one storm. There was some significant flooding with this portion of Katrina's track, but nobody knew what would eventually come down the road. The system weakened to a tropical storm again before making its way back out over the warm open waters of the Gulf of Mexico. This is where the second fascinating part of Katrina's story took place. She was essentially stationary for a long duration of time west of Key West, Florida. She was able to remain stationary because of a high pressure system in the upper levels of the atmosphere, as well as no directional winds being present to push her along. For this reason, she was allowed to sit and gain strength at a rapid pace. During this rapid intensification, Katrina became a monstrous category five storm with winds upwards of 175mph. Hey eyewall was textbook, and the structure was absolutely perfect. 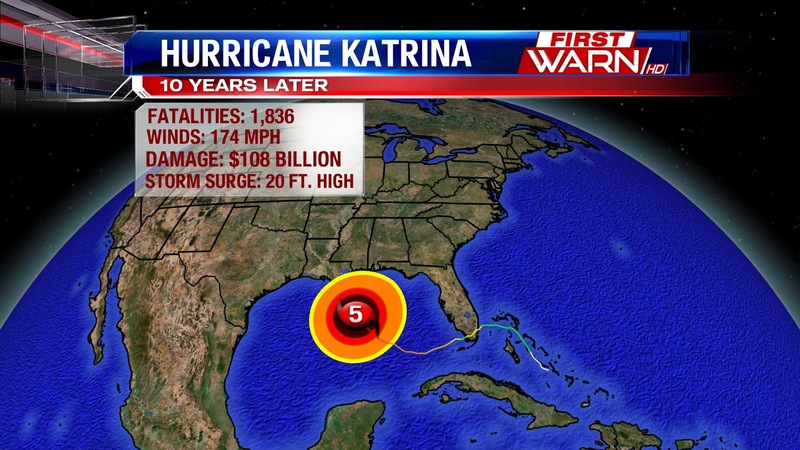 This is not what the Gulf Coast wanted to hear as Katrina took a turn to north after her intensification period. Areas from the Panhandle of Florida to Texas were becoming increasingly worried and concerned about Katrina and her eventual path of destruction. It was essentially inevitable that somewhere from Florida to Texas there would complete and utter devastation--this ended up being true for those in Louisiana and Mississippi especially. Katrina did weaken slightly to a category three storm before making landfall along the Louisiana-Mississippi border, but that did not mean anything regarding the destruction she would bring. The levees failed in New Orleans, eventually causing roughly 80% of the city to flood. For the first time, a mandatory evacuation was ordered for New Orleans. The Superdome was the place to go if you could not exit the city. And, even that highly sturdy structure suffered considerable damage. Storm surge of anywhere from ten to twenty-eight feet occurred along the coast, pushing water inland and causing catastrophic flooding well away from the coast. Katrina was so powerful and well-organized that she remained a named tropical system all the way until nearly the Tennessee-Kentucky border. Most tropical systems don't make it that far inland while still maintaining tropical storm characteristics. Katrina was different. Looking back, we all know how powerful and dangerous Katrina was. We all know what she caused. We all know that it was a storm to never be forgotten. The next question is: when will it happen again? Tropical Storm Erika is currently situated along the border of Haiti and the Dominican Republic slightly off the coast to the south of these countries. She is moving west-northwest at 21mph currently. Her peak sustained winds are around 45mph, making her a weak tropical storm. The reasoning behind her struggle to strengthen is due to unfavorable wind conditions in and around the storm. Wind shear is hostile to tropical systems, and there is plenty of shear in place in the environment where Erika is currently located. Here is a map providing a visual of where Erika is currently located and why she is not able to maintain her strength and organization. However, she is expected to move northwest and into the warm and supportive waters between the Florida Keys and Cuba. Once she moves off of Cuba by Sunday, she is expected to gain strength and evolve into a weak hurricane before eventually making landfall on the western coast of Central Florida. However, despite the current track forecast, it appears as though she wants to continue moving westward before turning north. For that reason, the current forecast track will likely be moved slightly westward. 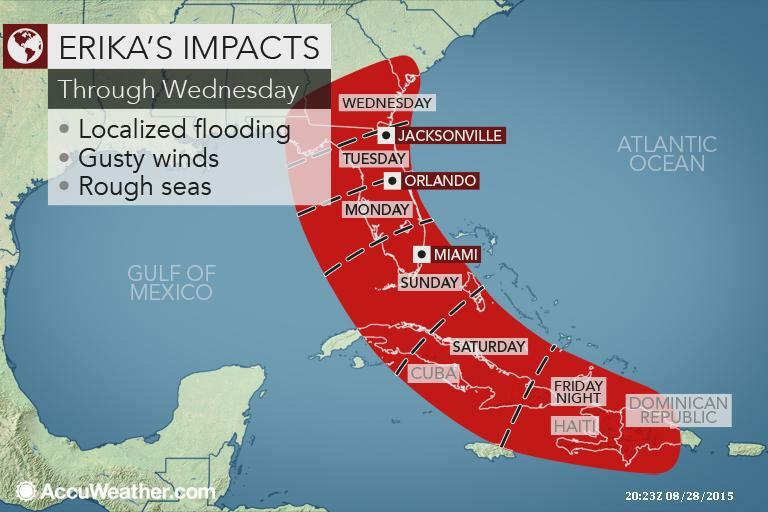 This means Florida landfall may not happen, and if it does, it would be in the Panhandle. Regardless, expect landfall somewhere in the Gulf of Mexico in all likelihood. Erika's strength will likely be a weak hurricane, so this storm is definitely something to monitor. We will provide updates as she evolves over the next few days. 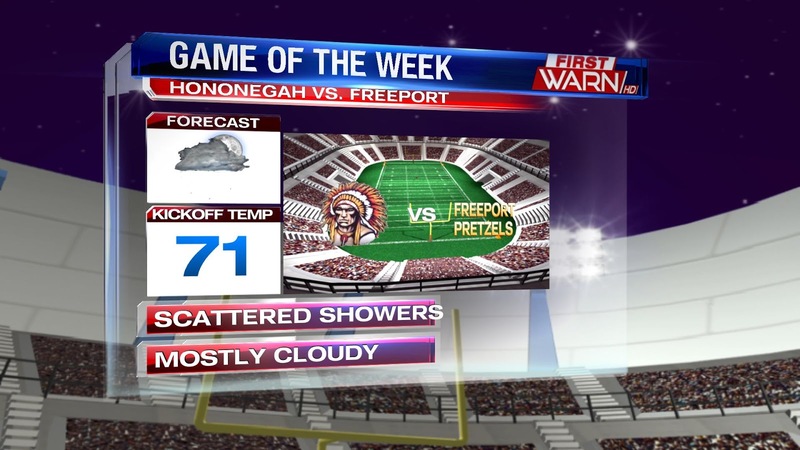 If you're heading out for Friday night football you'll want to grab an umbrella or poncho, because showers will be moving into the area for the afternoon and evening. Looking to the west, an area of low pressure is moving ENE across Iowa and will be moving into portions of northern Illinois and southern Wisconsin through the afternoon. Rain will move in earlier to the west and move east through the day. The thunderstorm threat for the day is fairly low because there isn't much instability across the area, which is a key ingredient for thunderstorms. But, hearing a rumble or two in the evening is a possibility. We look to be able to get most high school football games in before we see an increased threat for more thunder overnight, but again the instability is fairly limited, so the chance is small. Rain fall amounts look to add up to 3 inches in areas to the west of the Stateline, while around here we can expect 3/4 to an inch of rain through Saturday morning. These amounts can shift a bit through the day however, and will be closely tied to the area of low pressure. As the low pressure and cold front move through tomorrow morning we hold on to the chance for scattered showers as well as patchy fog through about 1pm. Highs on Saturday will only warm into the mid 70's, but the 80's return on Sunday will decreasing clouds. The National Weather Service in Chicago covers the following counties: Boone, Cook, DeKalb, DuPage, Ford, Grundy, Iroquois, Kane, Kankakee, Kendall, Lake, La Salle, Lee, Livingston, McHenry, Ogle, Will and Winnebago. 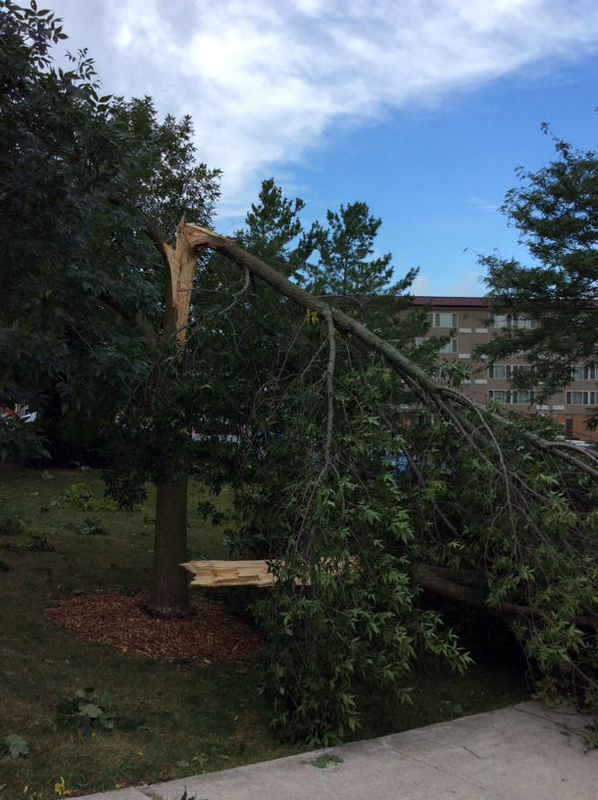 As of August 27th, 2015, a record number of tornadoes have occurred within the warning area of the Chicago National Weather Service. According to the weather service, the four tornadoes that occurred on August 18th, 2015 brought the yearly total up to 29. This breaks the old yearly record for tornadoes in their warning area of 27, set back in 2004. With the advancement of Doppler radar in 1992, dual polarization in 2012, and the development of the spotter network in northern Illinois, the ability to not only detect, but to actually visually confirm smaller tornadoes that may have otherwise gone unnoticed has increased. It's also interesting to see the past two years, 2014 and 2013, also within the top ten. It's possible. Skies have been fairly dry since the record breaking rainfall early last week. Since then, we've been dealing with a little more fall-like weather. This trend will continue for the rest of the week, but each day temperatures will continue to warm. Low pressure spinning in the southwest will ride overtop a ridge of high pressure in the center of the United States. Thunderstorms are likely from the Plains to Iowa and Minnesota by Thursday afternoon and evening, with heavy rain falling from Iowa into Wisconsin by Saturday night. For us, low pressure will track right overhead giving us the chance for a few showers and thunderstorms, but it doesn't look like a complete washout. Thunderstorms are in the forecast for Friday night, but the majority of the rain could very well hold off until after 8pm. Low pressure lingers through Saturday, so we'll hold on to the cloud cover with a few scattered showers into the afternoon. Rainfall amounts could add up to half an inch in some of the heavier showers. After that, skies look dry until the end of next week. 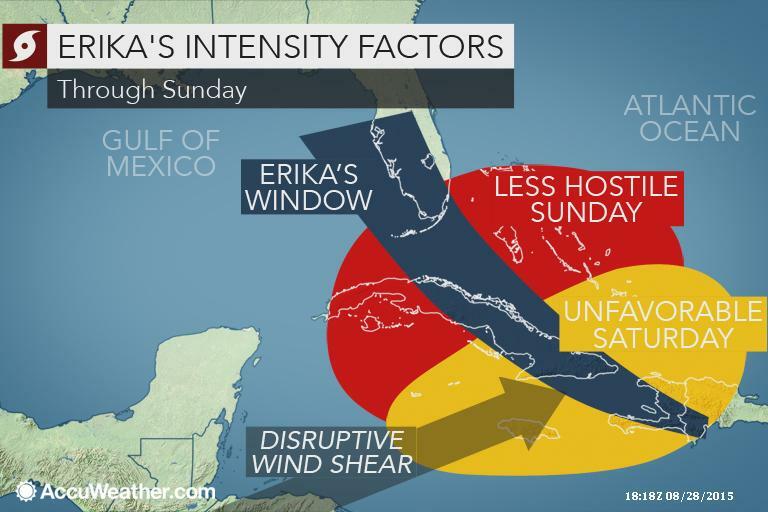 Tropical Storm Erika looks to reach hurricane status early next week, and its potential path brings it into portions of Florida. Currently Erika is located about 285 miles to the ESE of Antigua with maximum sustained winds at 45mph. Erika is moving to the west at 17mph but looks to take a more WNW turn in the next two days. A Tropical Storm Warning is in effect for St. Martin, Antigua, Barbuda, and the U.S Virgin Islands, along with others. Erika looks to reach the Leeward Islands tonight and then the Virgin Islands and Puerto Rico on Thursday. Total rainfall amounts look to be around 3-5 inches of rain, with max amounts near 8 inches across the Leeward Islands, the Virgin Islands, and Puerto Rico through Friday morning. August will likely wrap up slightly below the monthly average of 82 degrees. The extra push will come from this week's temperatures remaining nearly ten degrees below average. But, if you're not a fan of the cooler weather - don't worry. 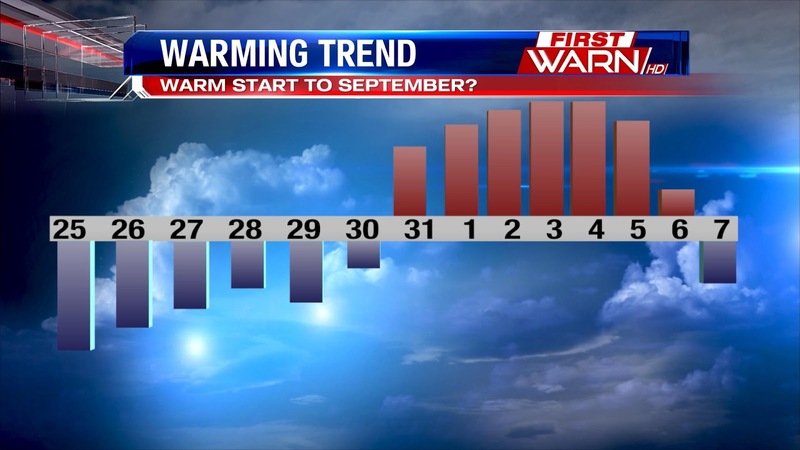 As we flip the calendar over to September, temperatures could be running in the other direction. We'll likely see temperatures rise into the middle and upper 80's for the first week of September, with some models indicating a return of the 90's. Sometimes forecast models tend to warm temperatures too far, too quickly. But this warm up is something that's been advertised for some time now. So, it's a good bet we'll see a return of the summer warmth. It's just a matter of how long it will last. The drought in the west and northwest will likely take years to reverse if the predicted El Niño this winter doesn't bring some much needed rainfall. Although, the downside to that is if the expected rain comes, flooding could be a major issue. 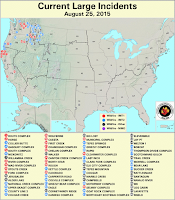 Over the past several months the dry, hot and breezy conditions have fueled wildfires to where nearly 70 fires are burning throughout the west and northwest, some very large. So much so, that a record number of 42 National Weather Service Meteorologist from around the country have been deployed to assist with the firefighting efforts. And for the first time since 2006, nearly 200 active duty military personal have been called in to help. 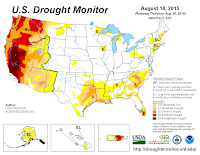 Monsoonal rains will help in the southwest, but not further north where rain is needed most. So as the fires continue to burn, the effects of it will still be felt and seen across the United States. The image to the left is a visible satellite image (snap shot of cloud cover) across the middle of the country shortly after 6:30pm Tuesday evening. Highlighted across the Great Lakes is cloud cover from an exiting low pressure system. And cloud cover can be seen further west as well. But in the middle, the more lighter white/gray coloring is the smoke and haze from the wildfires. If you can remember back about a month and a half ago, our skies were hazy for about a weeks time due to wildfires in Canada. 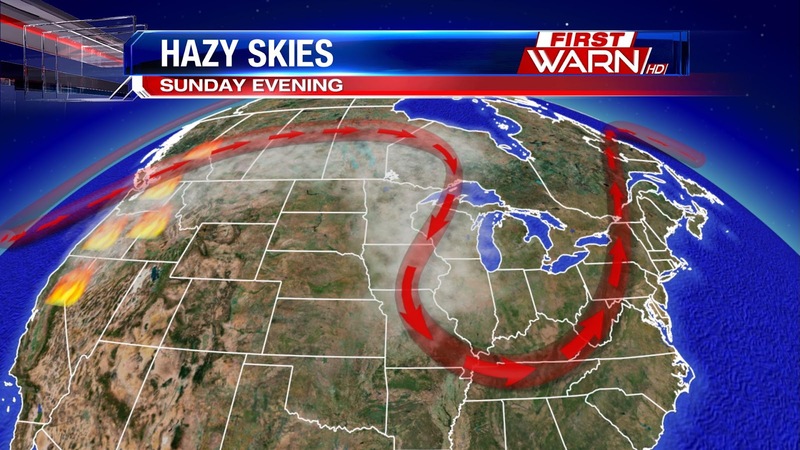 As the jet stream winds shift slightly further east towards the Great Lakes, and as our skies clear from the cloud cover you may notice a little more milky, or hazy, look to them. This would be from smoke from those fires out west. It won't get nearly as bad as what they're experiencing from Washington, Oregon, Idaho and western Montana where Air Quality Alerts are in effect until further notice due to high concentrations of smoke. Our blue skies may not look quite as blue late Wednesday and Thursday afternoon. You'll be feeling the wind the next few days as the Stateline area is in between systems. A strong low pressure system - in terms of August standards - will continue to pass to the north of us into the northern Great Lakes and southern Canada - keeping any rain a little farther north of us. As the low moves east, a high pressure system building to the southwest will also slowly shift to the east. 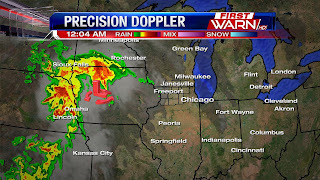 This creates a strong pressure gradient across northern Illinois and southern Wisconsin. Whenever there is a big change in pressure over a small area, a pressure gradient is generated. The greater the pressure difference over a smaller area will create a greater gradient, while a small change in pressure over a larger area will generate a smaller gradient. This gradient or change in pressure is what's giving us the stronger wind gusts today. Winds will gust up to 30mph from the west/northwest this afternoon. The next couple days will also be breezy at times, but not as windy as today. The low pressure system will also bring in cooler and dry air in from Canada - giving us a fall like feel through the majority of the week. High temperatures will be about 5-10° below average through the week with temperatures back into the 80's over the weekend. If you've noticed the sun comes up a little later in the morning and sets earlier in the evening, you're not alone! Since June 21st - which is the summer solstice - we've managed to lose 1 hr and 40 minutes of daylight! Our average daily temperatures follow this trend and have also decreased since the 'peak' of the summer heat in July. As we lose the longer days needed to sustain the summer warmth, the average daily temperature - and most times actual high temperatures - tend to decrease more rapidly. The winter solstice - December 21st - is the shortest day of the year when the sun will rise at 7:22am and set at 4:27pm giving us just a little over 9 hours of daylight. Don't worry, though. After that, the days slowly get longer again. However, we typically feel the heart of winter's chill during the months of January and February. The last full week of August is set to feature temperatures that we would typically feel towards the middle to end of September. Temperatures so far this month have been running pretty much on average. Yes, we've had a few warmer days and cooler ones, but overall we haven't had any major cold or hot spells to push us on one side or the other. That will change for the upcoming week when highs are forecast to remain in the lower to middle 70's until the end of the week. Following a cold front that passed Sunday, low pressure will continue to pull down a more fall-like air mass through at least Thursday, if not Friday. High temperatures will be in the 70's and overnight lows could drop into the upper 40's a couple nights. If you're not a fan, however, of the early taste of fall don't worry. We'll likely see highs rise back into the 80's towards the end of the upcoming weekend. 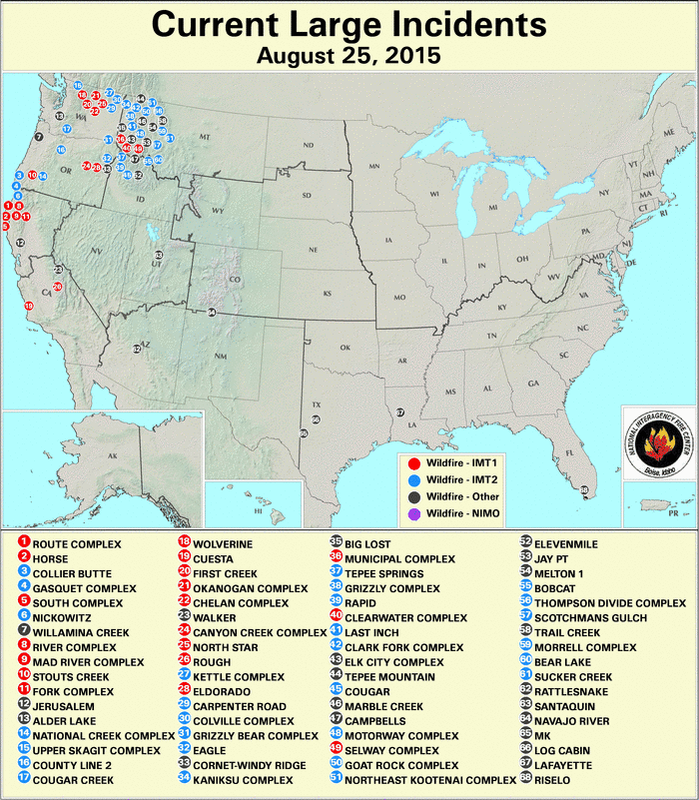 By now, I am sure many of you have heard about the wildfires in the Pacific Northwest. Namely, Washington State. Well, I figured I would right up an article about why they are so large and spreading so quickly. First, the pattern has been very stagnant across the United States recently. A ridge (high pressure) has been dominating the weather across the West, while the East has seen the resulting trough (low pressure). And, as we all know, a ridge and high pressure means nice, dry weather. Thus, the areas seeing these large wildfires have been continually dry with little to no precipitation to help alleviate the fires. That is the first thing we need. As you can see, there is just little to no moisture in the Pacific Northwest. Once your dew points drop below 50, especially 40, it is considered very to extremely dry. Therefore, Washington is experiencing very, very dry conditions with dew points in the 20's and 30's. That fuels wildfires, and can help maintain them. Third, the winds have been strong on occasion in Washington. As a result, the wildfires are spreading easier and more quickly. This makes it very difficult for firefighters to keep up with the flames. Therefore, the fires can spread fast and cover much more surface area when the winds pick up. Due to the wildfires and the smoke they are outputting, there have been air quality alerts and air quality problems in the areas near the fires. It is becoming dangerous for people who have breathing problems, the elderly, and young children with all of the smoke in the air in these regions. And, with the dry weather and bouts of windy weather, the fires are expected to continue burning. That will just continue making the air quality worse and worse for Washington and surrounding regions. If you have outside plans this weekend or want to head out to the Winnebago County Fair you don't have too much to worry about, it will be a pleasant weekend! There is, however, a little rain to contend with. Temperatures today will climb into the low 80's under mostly sunny to partly cloudy skies. Humidity will remain fairly low today with a dry air mass in place. Overnight lows tonight will drop to 60°. Saturday looks to be another nice day with highs in the mid 80's and partly cloudy skies. It will be a windy day though, winds will pick us ahead of an incoming cold front. Winds will gust up to 25mph through Saturday afternoon, and you might notice a little more humidity. By Saturday night the cold front will be in eastern Iowa and will bring in a chance for some showers after midnight on Saturday. Better timing for any rain though will be on Sunday morning, you might even hear a few rumbles of thunder. Temperatures on Sunday will reach 80° early in the afternoon before dropping off for the rest of the day. Temperatures will be on the cool side for the start of next week, we'll stay in the 70's through Wednesday. A new pattern looks to take shape though by the end of next week. High pressure builds to the south in the upper levels of the atmosphere and that will allow temperatures to warm up nicely. One model even wants to bring temperatures into the 90's! We will have to wait just a little bit longer to see if that will pan out, but in the mean time I hope you can enjoy the beautiful weekend ahead! 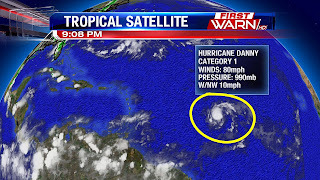 The Atlantic hurricane season has been fairly quiet this summer, but that may be changing as Hurricane Danny has now formed in the Atlantic. We're nearing the peak of hurricane season which is in the middle of September. Satellite data indicates it's an unusually small tropical cyclone, but it's reached Category one strength. Winds are sustained around 80 mph, pressure is at 990mb, and it's slowly moving to the West/Northwest around 10mph. A low wind shear environment and warm sea surface temperatures will allow Danny to holds its own, and even strengthen a little over the next 48 hours. 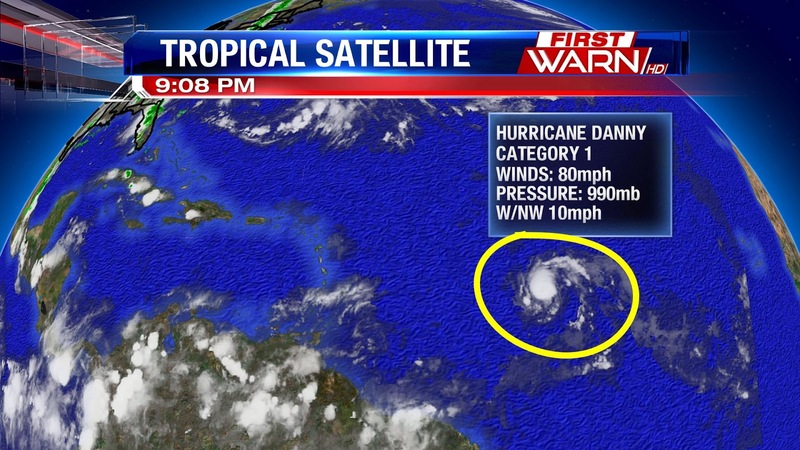 Current forecasts have Danny maintaining hurricane status before weakening below hurricane strength by early next week. Impacts could potentially be heavy rainfall and stronger winds for the Lesser Antilles, along with the Caribbean Islands. As we near the end of August, you may be thinking about packing up the kids and heading out for one last weekend trip before school officially starts for everyone in the next week or two. An approaching cold front in the High Plains and upper Midwest will bring thunderstorms from the Dakotas, eastward to northern Wisconsin during the afternoon and evening Saturday. Some of the storms could be strong to severe across Minnesota and northern Iowa. By Sunday, the cold front will be moving through Wisconsin and Illinois shifting the threat for rain east into the Great Lakes. Stronger storms are possible across the state of Michigan. After that, temperatures will once again cool into the 60's and 70's for the start of next week. So, you may have to send the kids back to school with the jackets. Four days in the 90's over the weekend and earlier this week, followed by 80's on Tuesday and temperatures in the 60's today, it's been quite the temperature ride. Strong low pressure in the upper Great Lakes pulled down a much more cooler air mass Wednesday afternoon and that air mass will be in place Thursday. By Friday, winds shift around to the south giving temperatures a boost back to the low 80's - more seasonable for this time of year. But no major warm up. Another cool down will follow the passage of a cold front Sunday with highs dropping back into the 70's for the start of next week. After that, though, models are indicating that a bigger warm up could be in store for the last few days of August and beginning of September. Temperatures warming back near 90 degrees are very well possible. So don't let this cooler weather fool you. We've still got a lot more of summer to go. 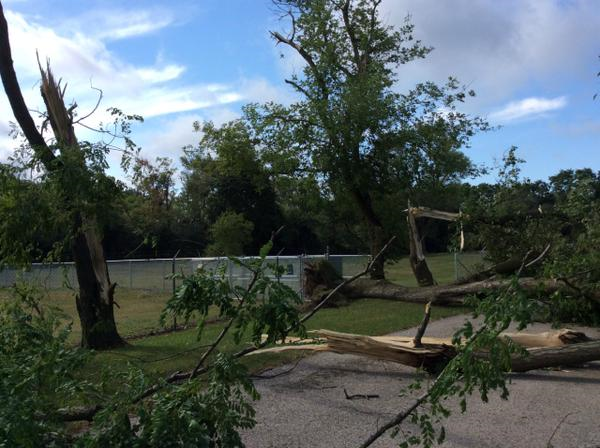 Tuesday's rainfall broke a daily rainfall record in Rockford. The old record was 2.23" set back in 2005. Yesterday's rainfall added up to 2.87"! And with most of that coming down just within in a couple hours, flash flooding was the biggest threat. While most of the flood waters have receded, there is still some standing water. Other than a passing sprinkle or shower tonight, skies will remain dry until the weekend. The Milwaukee National Weather Service confirmed than an EF-1 tornado touched down last night in Lake Geneva, WI (Walworth County), around 9pm. 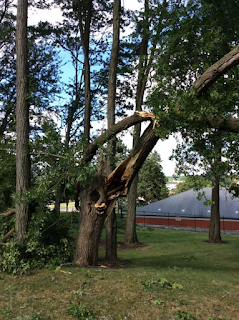 The NWS deployed survey teams just after 8am this morning to survey the storm damage. 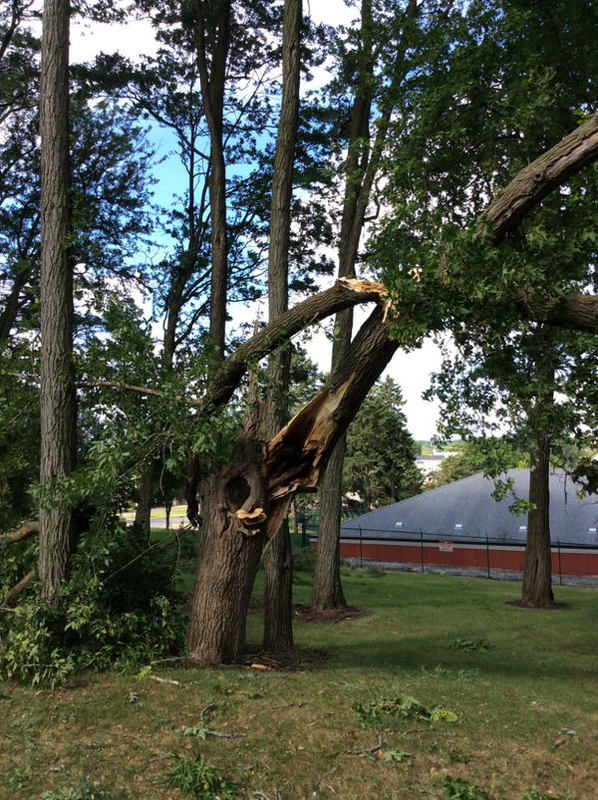 Survey teams are still gathering information on the damage. For more on what we have so far, click here. 10:40pm Update: Rainfall is winding down area wide Tuesday night. The Flash Flood Warning continues for Winnebago until 2am, and has been canceled for Ogle County. Now that the rain has ended, any flooding issues will continue to subside by daybreak Wednesday. Area streams and creeks could still be running high, however. 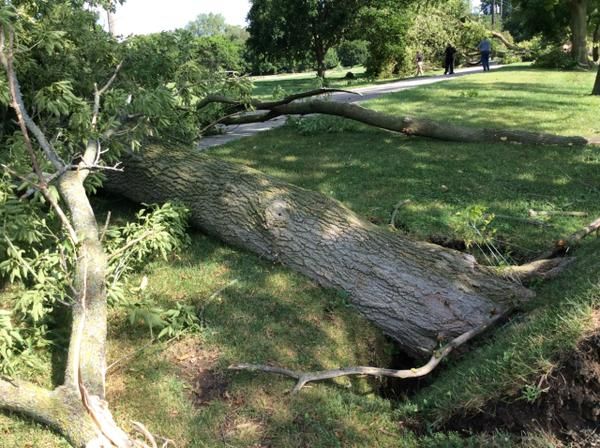 The Milwaukee National Weather Service will be out Wednesday morning in Walworth County near Lake Geneva conducting a damage survey due to multiple reports of trees down. As soon as we get those reports, we'll pass them along. Have a safe night and remember if you come across any flooded roadways, now or in the future, to 'Turn Around, Don't Drown'! (9:48:32 PM) nwsbot: Local Storm Report by NWS DVN: 1 SE Savanna [Carroll Co, IL] law enforcement reports FLASH FLOOD at 06:00 PM CDT -- road washed out due to flash flooding se of savanna. time estimated from radar. (9:38:08 PM) nwsbot: Local Storm Report by NWS LOT: Capron [Boone Co, IL] cocorahs reports HEAVY RAIN of M2.06 INCH at 09:20 PM CDT -- rainfall in 2 hours 42 minutes. (9:16:17 PM) nwsbot: Local Storm Report by NWS LOT: Rockford [Winnebago Co, IL] emergency mngr reports FLASH FLOOD at 08:00 PM CDT -- reports of high water and drainage issues mainly across the northeast and southeast portions of the city with cars floating in the standing water. 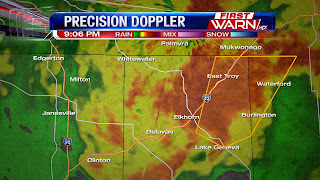 9:05pm Update: Severe Thunderstorm Warning for Walworth County in Wisconsin until 9:30pm. 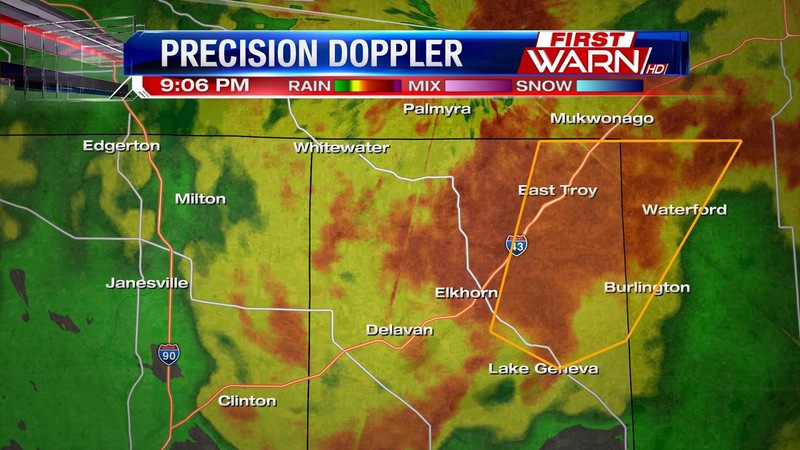 Wind gusts to 60 mph and heavy rainfall possible. Remain indoors and away from windows. 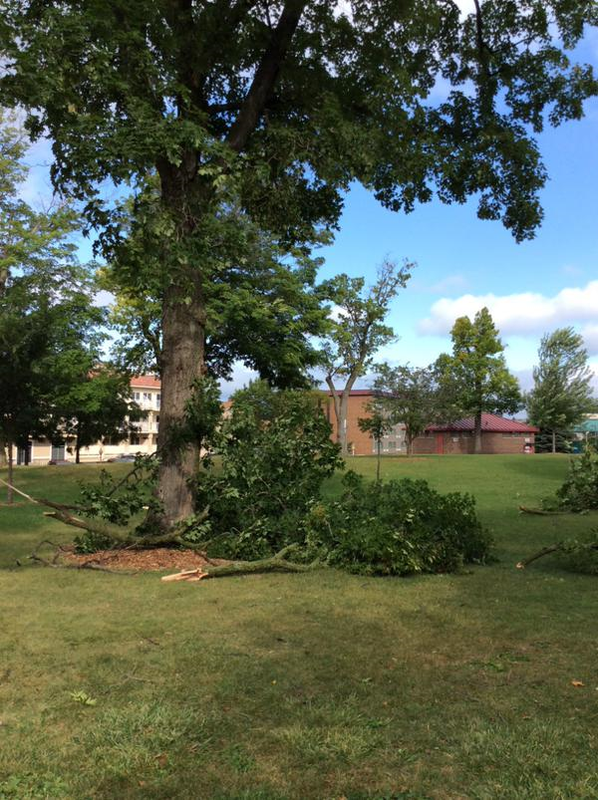 Tornado Watch canceled for Winnebago, Ogle, Boone, Lee and DeKalb counties. 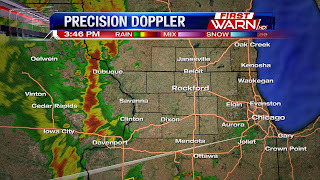 Continues for Rock, Walworth and McHenry counties. (7:24:24 PM) nwsbot: Local Storm Report by NWS DVN: N Davis [Stephenson Co, IL] cocorahs reports HEAVY RAIN of M1.00 INCH at 06:30 PM CDT -- 1 inch of rain in 10 minutes. (7:24:24 PM) nwsbot: Local Storm Report by NWS DVN: 2 WSW Chadwick [Carroll Co, IL] cocorahs reports HEAVY RAIN of M2.25 INCH at 06:30 PM CDT -- in past 75 minutes. nearby creek out of its banks. (7:24:24 PM) nwsbot: Local Storm Report by NWS DVN: Shannon [Carroll Co, IL] broadcast media reports HEAVY RAIN of M2.45 INCH at 07:15 PM CDT -- storm total. weather watcher report relayed by media. (7:15:51 PM) nwsbot: Local Storm Report by NWS DVN: 5 NW Lanark [Carroll Co, IL] trained spotter reports HEAVY RAIN of M2.90 INCH at 07:15 PM CDT -- rainfall in past 1 hr 45 min. 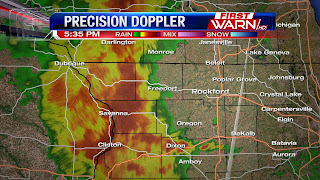 A Flash Flood Warning has now been issued for Winnebago and Ogle counties until 2am. Rainfall amounts of 2" to 3" have fallen in the warned area, with another 1" to 2" of rainfall likely. Thunderstorms are very slowly lifting northeast, only enhancing the flooding threat across north-central Illinois. This is turning into a serious flooding issue. Remember to NEVER drive through a flooded roadway. (6:57:57 PM) nwsbot: Local Storm Report by NWS DVN: 4 ENE Freeport [Stephenson Co, IL] trained spotter reports HEAVY RAIN of M1.60 INCH at 06:56 PM CDT -- total from 6 to 645 pm. over 1 inch in first 20 minutes. 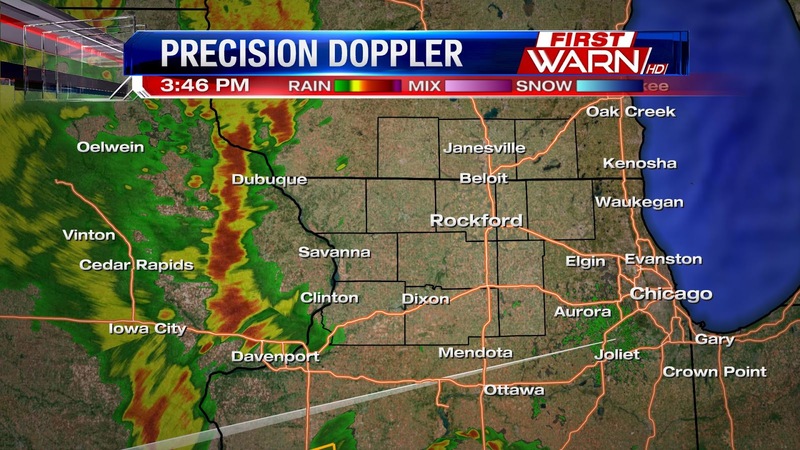 6:45pm Update: A line of stronger storms extends from Monticello down to near Rockton. Wind gusts to 50 mph and pea sized hail are possible. Heavy rainfall will continue to remain the biggest threat. 6:00pm Update: Rainfall totals nearing three inches are very well possible with storms currently moving through. Very high moisture content in the atmosphere nearing two inches will allow for the heavy rain threat to continue through 9pm. 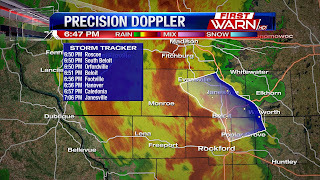 5:50pm Update: A Flash Flood Warning has been issued for Jo Daviess, Stephenson, Carroll and Whiteside counties until 11:45pm. Radar estimates of over two inches of rain has fallen in those areas, with an additional one to two inches of additional rainfall expected. This is developing into a serious situation. Remember to NEVER drive through a flooded roadway. 5:40pm Update: As of right now there are no current warnings for the area, but storms in northwest Illinois in southern Jo Daviess and Carroll counties are nearing 40,000ft. Heads up for small hail and gusty winds. Very heavy rainfall will likely cause ponding on the roadways as well. 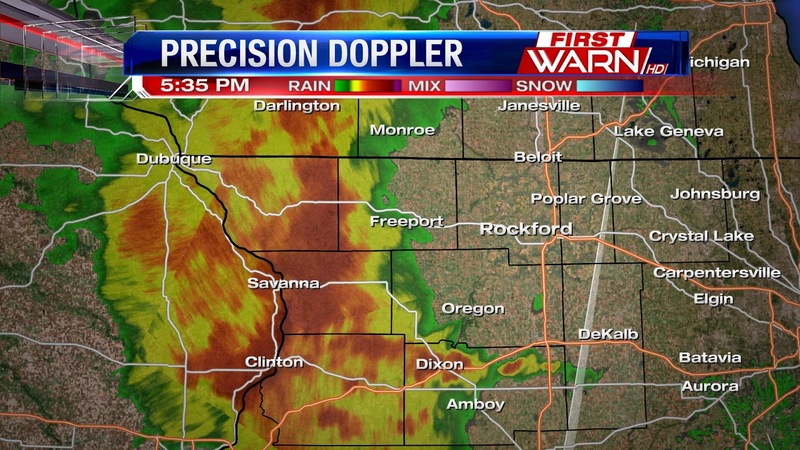 Look for the heaviest of the storm to be near Freeport within the next 20 minutes and Rockford by 6:30pm. McHenry County has now been added to the Tornado Watch until 10pm. A Tornado Watch has been issued for northern Illinois and southern Wisconsin through 10pm this evening. As low pressure moves northeast from Iowa to Minnesota this evening, storms currently over eastern Iowa and west-central Illinois are expected to increase and be pulled northeast by tonight. Cloud cover through the morning and early afternoon has limited the available energy across far northern Illinois and southern Wisconsin. Less cloud cover and more sun in west-central Illinois and far eastern Iowa has caused the instability to increase over the past couple of hours. Right now, the radar over the immediate Stateline is quiet. Storms continue to develop to the south and west. Earlier, there was a tornado warning for Jones County, IA as a tornado was reported there. Our tornado threat is low, but it's not zero. If we were to get thunderstorms (which we likely will), the greatest threat from them would be damaging wind gusts. 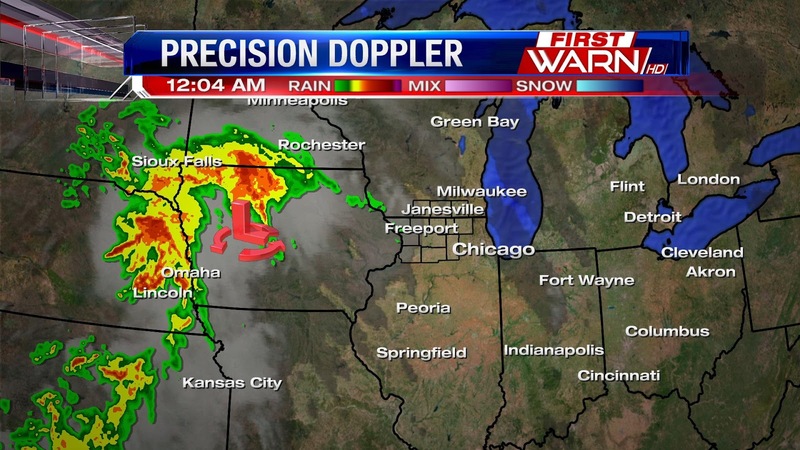 The surface low pressure will move from northwest Iowa into southern Minnesota tonight. At the same time, an upper level low will move northeast out of the central Plains through Missouri and into northwest Illinois between 5pm and 8pm. It's with that low that our storm threat will increase. As the low approaches from the southwest the shear, or spin, in the atmosphere will increase. Even though the instability - or CAPE (Convective Available Potential Energy) won't be overly high, the increase in shear may be enough to sustain any threat for severe thunderstorms this evening. 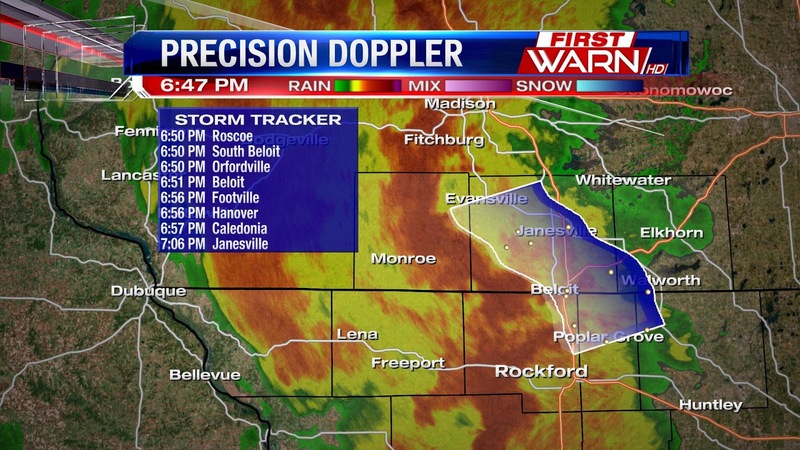 The storms currently in northeast Iowa will slide through northwest Illinois (Carroll, Jo Daviess and far western Stephenson counties by 5pm). Storms currently in west-central Illinois will move closer after 7pm. If you do have any plans for this evening, make sure you keep a watchful eye to the sky and radar. We'll continue with updates as we head through the evening, so be sure to keep checking back. The Winnebago County Fair kicks off today in Pecatonica at 4pm! If you decide to head out you'll want to bring the umbrella and keep your eyes to the sky. Through the afternoon today we could see an isolated storm or shower, however rain and storms will be more scattered as we head closer to dinner time tonight and this evening with our next cold front. The front is currently bringing storms to the central and northern plains as well as into Iowa today. The strong storm threat today though will stay slightly west of the Stateline area, but we could get some heavy downpours in any storms today because we have a lot of moisture available in the atmosphere to tap into. We hold onto some of the storms overnight into early Wednesday. Once the front passes Wednesday morning dry air will begin to filter in behind it and will help to bring an end to the rain, from the west to the east. Winds however will pick up behind the front, gusting up to 30mph from the west. Temperatures will also fall into the mid 70's Wednesday and Thursday with the heat slowly rising through the weekend. Thunderstorms Monday evening remained below severe limits, but one particular storm was a sight to see near Rockford. 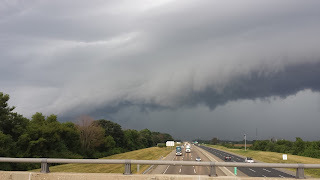 It produced a shelf cloud, followed by gusty winds and heavy rain. I'm sure many of you have seen them, as they are very common around here. At first glance, they can appear very ominous and can sometimes be low hanging to the ground. The lower hanging clouds are often times mistaken for funnel clouds or tornadoes. The greatest threat with storms that produce shelf clouds are damaging wind gusts and heavy rainfall. They can form with a line of storms, or a single storm cell (like what we had earlier today). 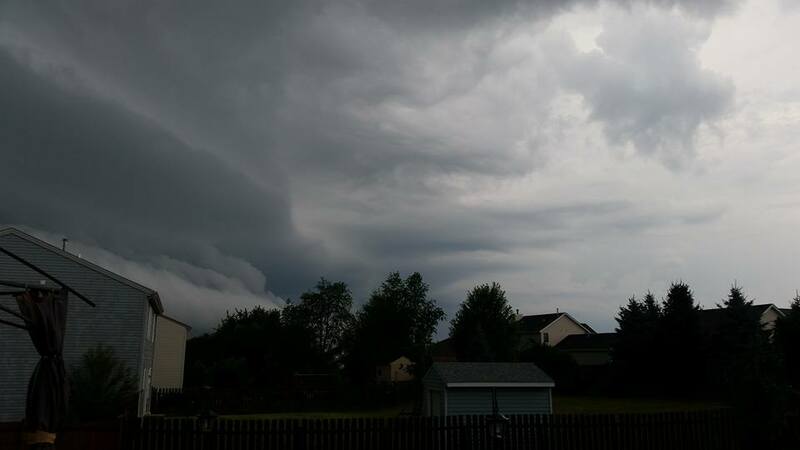 The air flowing around a shelf cloud is very turbulent, giving it the rough edged look that you often times see. It's not a wall cloud, but with stronger thunderstorms they can sometimes produce brief, spin up tornadoes. 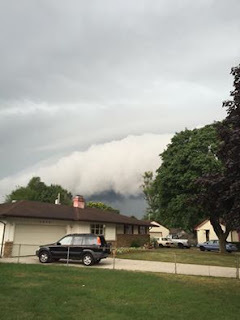 So, how exactly do shelf clouds develop? All thunderstorms have updrafts and downdrafts. The updraft is the warm, moist air flowing up into the storm and the downdraft is the rain cooled air. 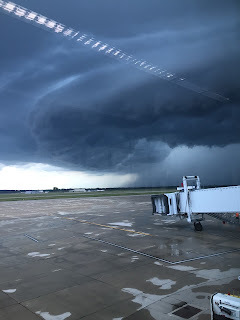 As the rain cooled air descends in a thunderstorm downdraft, it spreads out once it hits the surface of the earth. This forces the warm, moist air ahead of the thunderstorm to rise along the leading edge of the storm (often called a gust front). When the warm, moist air condenses you see the shelf cloud. Scary looking, yes. But now when you see these types of clouds, just know that the wind will likely pick up shortly after it passes and you're going to be in for some heavy rain - and possibly hail. Here are some of the photos you shared with us this evening! Enjoy!